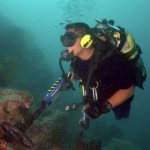 Do you own an underwater metal detector, do you love hunting for treasures underwater? Then this is the right group for you, sign up today and get in touch with other Underwater Treasure Hunters, this category is probably more than ever important to go out with a metal detecting buddy ;). Testing my Fisher Underwater Metal Detector for the first time today, excited! Watched some tutorials earlier, seems like a decent machine for lakes etc :)… Will report back soon.